Prof. Rundel, Department of Ecology and Evolutionary Biology, UCLA. The Mediterranean is highly specialised biome which occupies only 2.2 percent of the earth's surface, but contains 20% of the worlds plant species.1 The complex interaction of environmental factors has created a unique but fragile ecosystem, characterised by a mosaic of interacting and interdependent plant communities, which host a large variety of vascular plants including many rare taxa (species and sub-species), some of which are threatened with extinction. The Mediterranean biosystem occurs in only five locations, South Africa, Western Australia, California, South West Chile and the Mediterranean basin itself, which is the largest area with this type of ecosystem. All these areas are on the western seaboard of large continents, with a distinctive climate, dominated by a high pressure system which creates the specific weather conditions known as the Mediterranean Climate, with hot dry summers and cool wet winters. The areas were all subjected to dramatic seismological upheavals in recent geological time, which have created high mountains and rugged coastlines, during the latest geological era, they have all been influenced by recurrent ice ages contrasting with warm arid cycles and by the unpredictable impact of wild fires. In addition to these natural phenomena, the plant profile of the Mediterranean Basin has been greatly modified by man and his ancestors and influenced by the spread of civilisation. 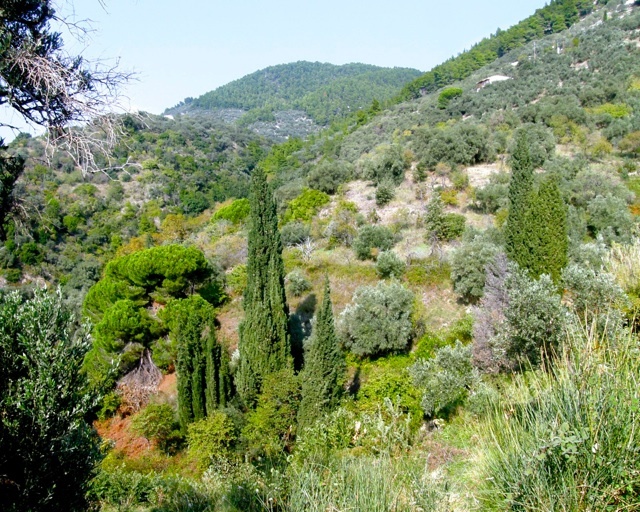 Plants in the Mediterranean have to cope with the stresses created by the long hot dry summers and to tolerate the cool, sometimes frosty, wet winters; they have all developed a variety of strategies to do so. Sclerophyll from the Greek sclero (σκληρό) meaning hard and phyllo (φύλλο) for leaf. Many Mediterranean plants secrete aromatic, volatile oils and have a hairy or waxy covering on leaves, which give plants the silver, grey appearance; these strategies reduce water loss and protect against high temperatures and excessive light. 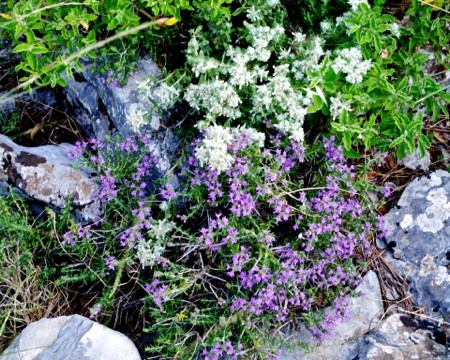 Many are culinary or medicinal herbs: sages, thymes, and felty germander (Teucrium pollium): They abound on the hillsides of Skopelos. 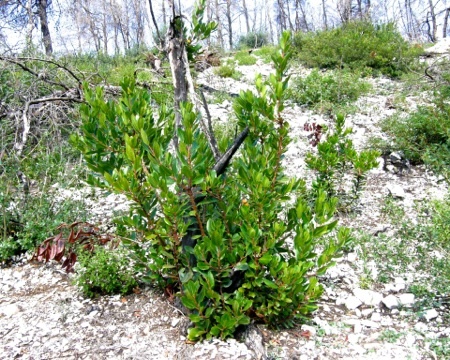 Some plants, including cistus and aubretia, have lush, green leaves in winter, which become small and crinkled in summer to reduce the surface area: a phenomenon known as seasonal dimorphism. The commonest type of plant in the Mediterranean are annuals, some of which also grow in more temperate climes; they take advantage of wet winters to grow rapidly, flower and to create seeds, which are able to resist the summer drought and remain dormant until conditions are favourable for germination. 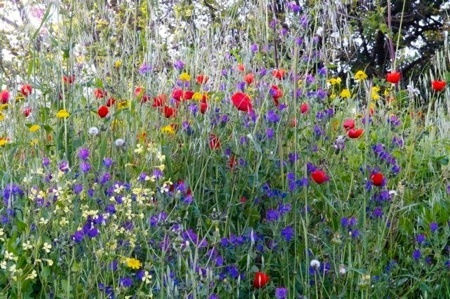 Annuals include ecologically important clump forming grasses but also poppies, species of clover, pea and medick and many of the daisy-dandelion family. It is mainly flowers in this group which account for the extraordinary explosion of colour which occurs in Skopelos, every year in spring and early summer. 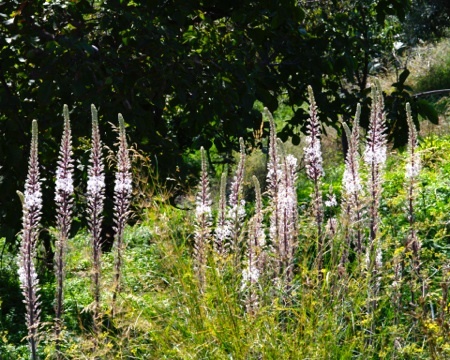 Other herbaceous plants survive through summer in the form of underground storage organs: bulbs, corms and rhizomes; many of the spring bulbs, which are grown in the gardens of the world had their origins in the Mediterranean region, including crocuses, tulips and narcissi and also includes the iconic Mediterranean species the sea squill, with its huge bulbs. 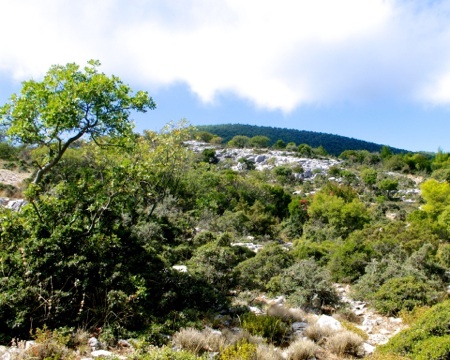 The Mediterranean Basin has been designated a Biodiversity Hotspot, the third richest in the world. This biodiversity is not confined to vascular land plants: the sea contains 7.5% of the world’s marine fauna, 14% of dragonflies are endemic to the area and there is even marked biodiversity of micro-organisms found on monuments in Mediterranean basin. The development of the Mediterranean climate system coincided with seismic upheavals which led to the formation of the Mediterranean Sea, the surrounding mountains and the scattered islands of the Aegean. The dramatic geological events included an increased frequency of volcanoes with resulting conflagrations which destroyed large tracts of vegetation. The surviving plants have evolved adaptations to fire, either to protect against or recover rapidly from burning. 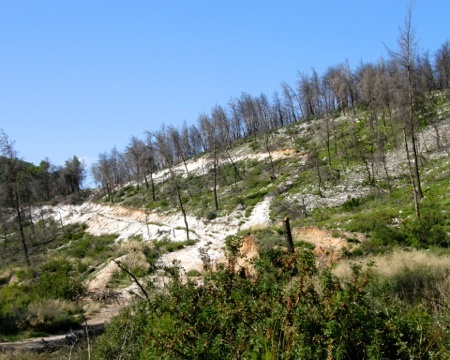 Many of the Mediterranean plants are not only have strategies to survive fire but are also pyrogenic, that is they are readily combustable and this has given them an evolutionary advantage, as fire destroyed their competitors. 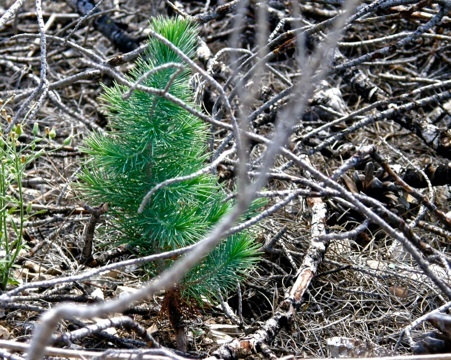 Aleppo pine is a plant which has evolved in response to fire. The cones remain closed until exposed to high temperatures, when they open to release seeds, which then germinate to produce new trees. 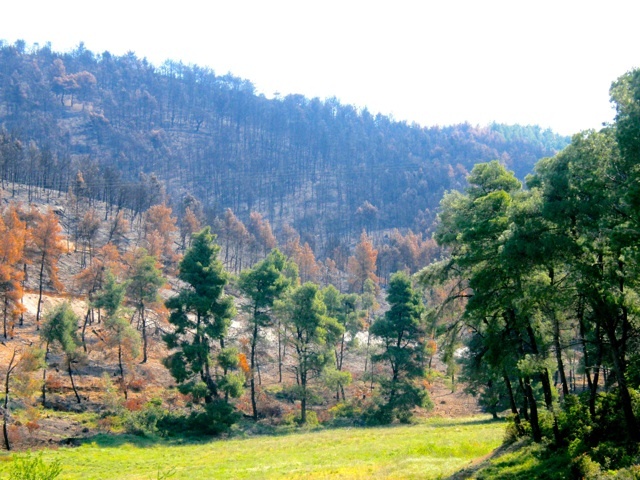 Although fire contributed to its development, uncontrolled fire is now a major threat to the Mediterranean Ecosystem and almost invariably result in species loss, particularly if heat is intense or when fire recurs in the same area within a few years. Legislative measures have been introduced to control wildfires, but with limited success. Many fires in the Mediterranean are man made, caused by accident or deliberately, but natural fires, resulting mainly from lightening strikes have continued to the present day. 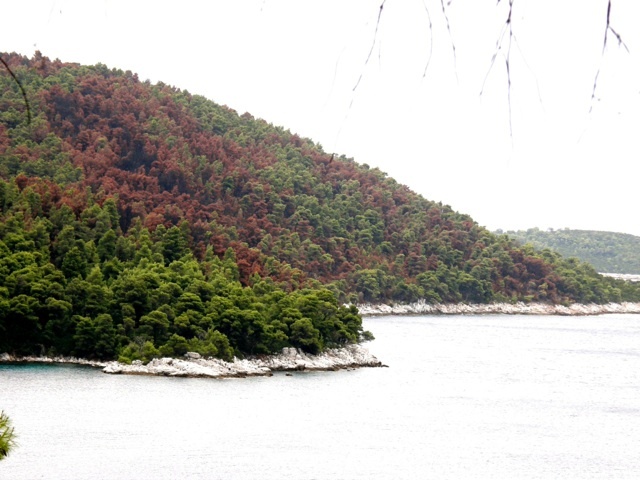 Aleppo pine, which is the dominant species in the forest of Skopelos, is particularly vulnerable to fire, especially when it is poorly managed and has a dense understory of woody plants and dry forest litter at ground level. Many of the traditional methods of forest management, including cutting for timber, charcoal production, and grazing by goats helped to reduce the risks. 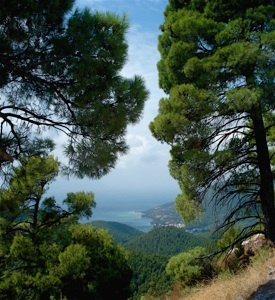 The lighting of fires on Skopelos is controlled by strict laws, and allowed only during wet winter months, when it is deemed safe by the local fire brigade and everyone who lives on the island is alert to the risk of severe conflagration and helps to protect their island. 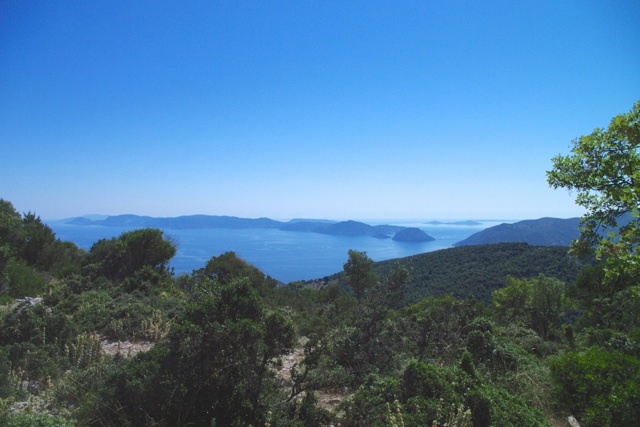 In spite of this, several serious wildfires have occurred on Skopelos, the most severe in March 2007, which laid waste a vast tract of land above Agnondas, which has still not fully recovered. 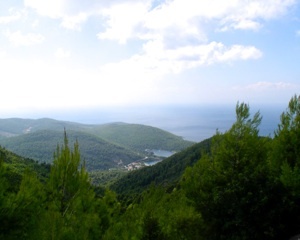 The worst wildfires, in Greece in 2007, was on the mountain of Parnitha, extending over 150 square kilometres: A fire of this extent would totally destroy Skopelos, threatening human life as well as the environment. 1.Rebecca Shaw, director of conservation science in California. 2.Polunin, Oleg and Anthony Huxley. Flowers of the Mediterranean. Chatto and Windus. 1981.